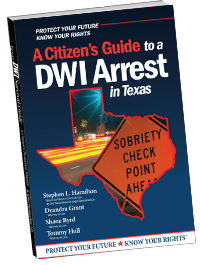 If You’ve Been Charged with a DWI, Talk to the Guy who Wrote the Book. Should you answer any questions other than your name and address? If you are asked to get out of your car, can you leave? When should you speak to an attorney? Should you agree to perform roadside tests? Should you agree to have your eyes tested? Is a handheld breath tester reliable? Should you consent to a breath or blood test, if you are asked to take one? Download the Guide to find out how to further protect your rights! and remember, be polite and produce requested documents.